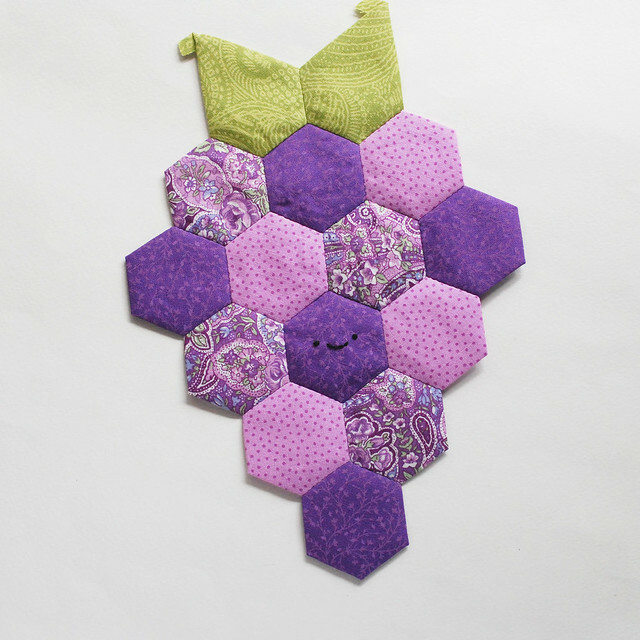 For the last few weeks I've been sharing different fruit placemats made using English paper piecing. This has definitely been a big project...bigger than most of the things I post here. But I can't tell you how much I've enjoyed it. And now that all four placematss are finished, I'm really thrilled with and proud of the result. This last one is a bunch of grapes, and no joke...as I was about to take these photos, my mom was preparing a pitcher of grape juice. She suggested that adding ice would look good in the pictures, and I agreed. Thanks, Mom! When eating grapes, I prefer the green variety, but for something like this, purple was the way to go. Much more traditional, right? Feel free to make yours whatever color of grape you like best! 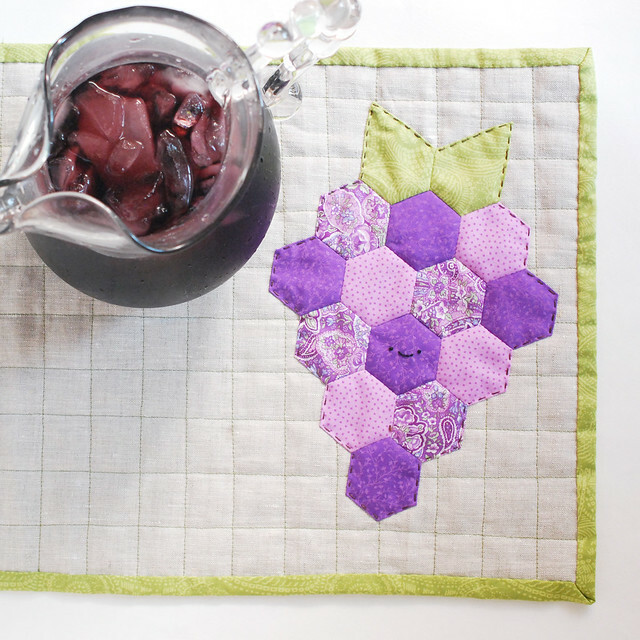 To make the placemat base, visit my first post in the Fruity Quilted Placemat series. 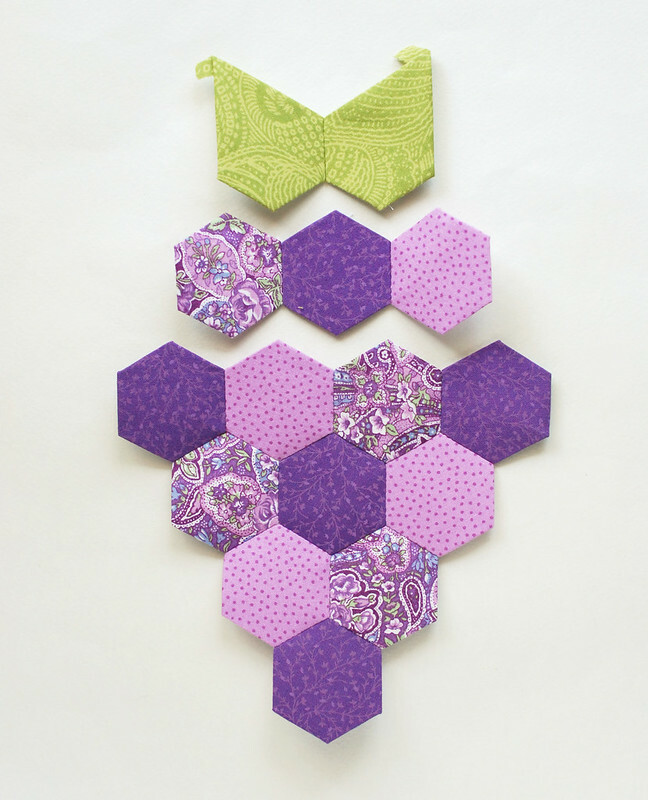 Using English paper piecing, make 13 purple hexagons and two green jewels. Join them together in rows as shown, then put the rows together. I like to press my pieces before removing the papers, and after removing them. It helps them keep their shape. 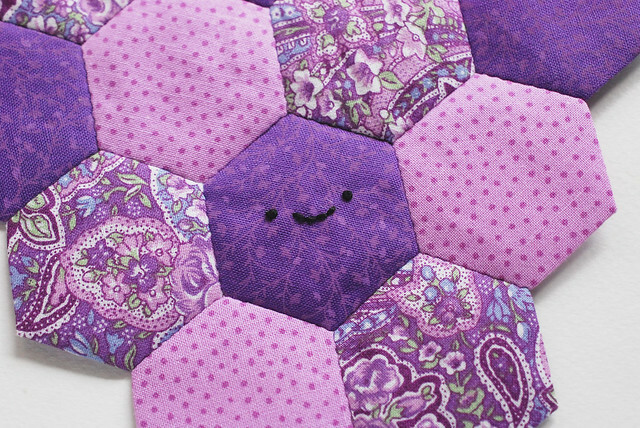 After you remove the papers, stitch a face onto one of the hexagon centers. It's just two french knots and some backstitch for the smile. 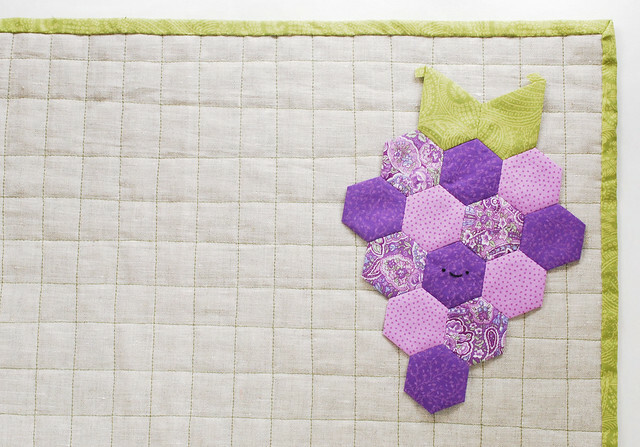 Decide where you want the grapes situated on the mat (all of mine are on the right side at a slightly jaunty angle), then use fabric glue to tack it in place. You don't need a lot, and I recommend that you only use it on the seams or the seam allowances because the fabric is double there. 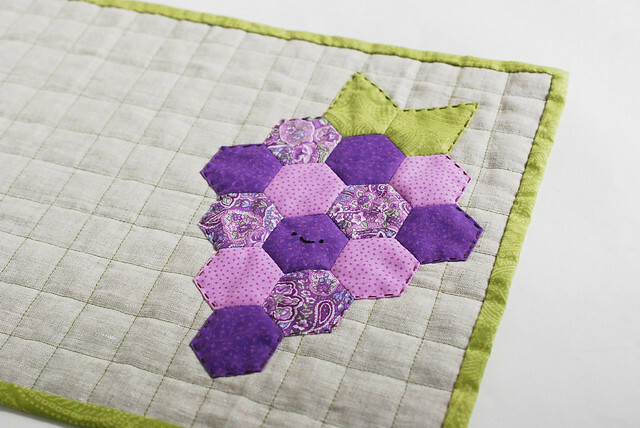 With three strands of brown embroidery floss, stitch around the grapes with running stitch. 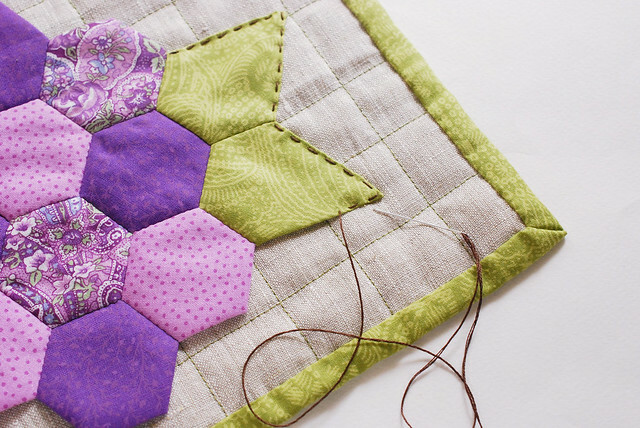 Trim and tuck the flaps on the leaf points under as you stitch around them. And just like that, you're ready to set the table! I chose to make these fruits into placemats so that I could share them one at a time, without too much rush...both for you and for me. But my mom told me that she really would have loved these as a table runner. Perhaps you would too! Just extend the length of the mat and follow the same base instructions. 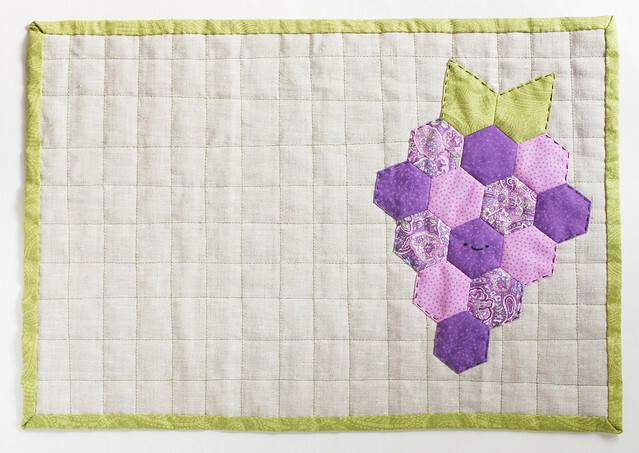 Then, add all of the fruit shapes along the runner. You could even throw in some extra berries! Speaking of extra berries, I honestly think that I've only scratched the surface when it comes to hexagon fruit. Use your imagination and see what you come up with! As for me, I'm thinking that I need to be thinking about other kinds of things I could make along these lines. What do you think? For now, we'll enjoy these at my house, and I hope you give them a try too. Find all of the placemat posts here! 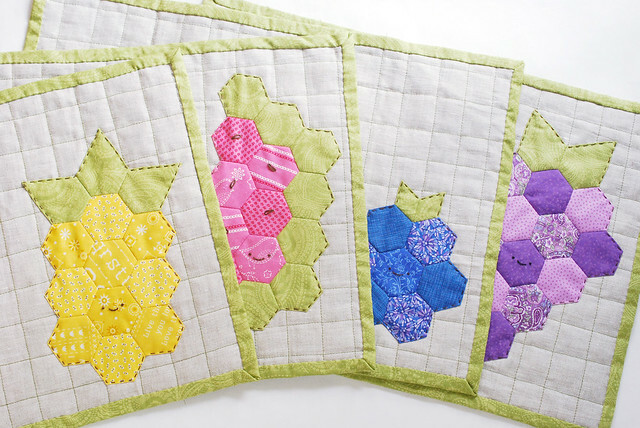 i love how your set of fruity placemats turned out! :) very cute! I had fun making the different fruits!! More! More!! Super cute! 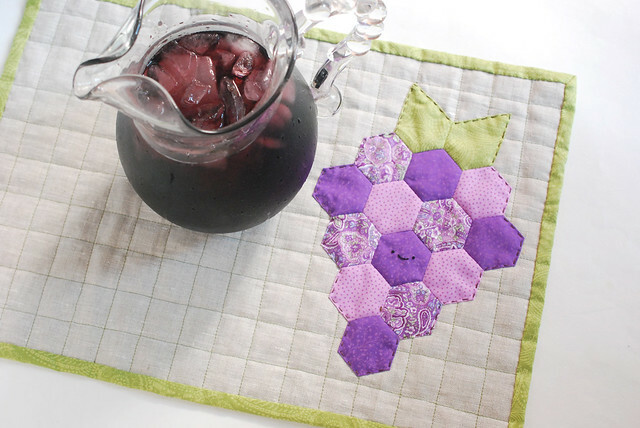 But I can't TELL you how nervous it makes me to see that grape juice pitcher on top of that beautiful creamy linen! Haha! You're not the only one. You have no idea how many times I wiped it off and then was SUPER careful! Really can't get over how amazing these are! 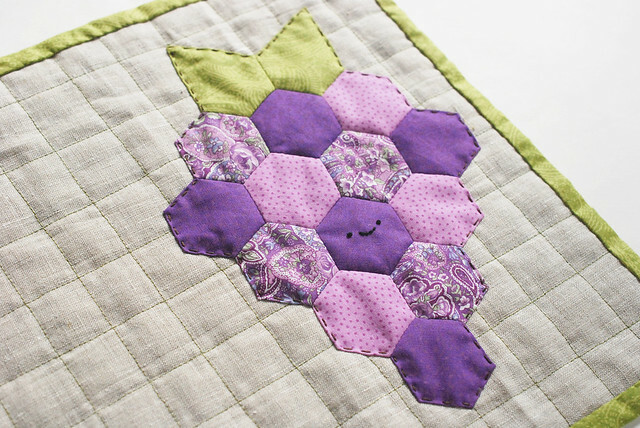 So cute, I want to make them all!